MatureSinglesClick.com is a dating site dedicated to helping mature singles over 40 find their match. It offers amazing features like saved searches and the Mega Wink, an easy-to-use mass messaging option also providing users with pre written message ideas to get them started. With the site boasting some 4,000 new members every week, MatureSinglesClick just might be the perfect way for you to connect with someone new. 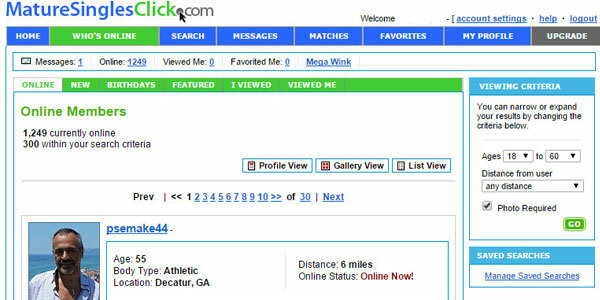 MatureSinglesClick.com offers their users the ability to strike up an immediate conversation with other online members thanks to the ‘Who’s Online’ tab. 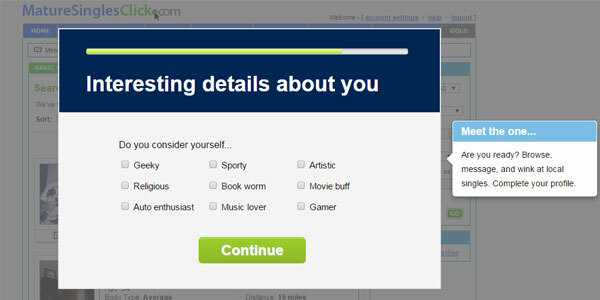 The automated matching system helps to pair you with partners who share your interests and values. Also, members can make a ‘Favorites’ list to remember that one guy or gal you really want to message when you have more time. Every member has the option to fill out a detailed profile about themselves to give users a sense of your personality, including sections such as ‘Describe some fun and interesting things you like to do around your city’. MatureSinglesClick also offers a special feature called the Mega Wink. It allows you to message dozens of people at once for free, with a wide range of pre-written messages for you to choose from to take the hard work out of deciding what to say. Signing up is very easy and straightforward. You only need to provide a few details, including your birth date and gender in order to get a basic profile up and running. However, you can't use many features until you fill out the additional text boxes and add a photo. This MatureSinglesClick.com review found that you can block people from viewing your profile. You are able to contact support to get an IP address blocked if you experience harassment. However, you maintain complete control of how much information shows up on your profile. This website does no screening or checking up on their members so be sure to stay safe online. You can send messages and browse profiles for free, but if you want to read the responses to your flirting efforts, you'll need to pay for a premium membership. Prices start at $30 a month. You can save a bundle by paying for three to six months of access at once, at price points of $20 monthly and $15 per month respectively. Finally, paying for a full year lowers the cost to just $10 a month. 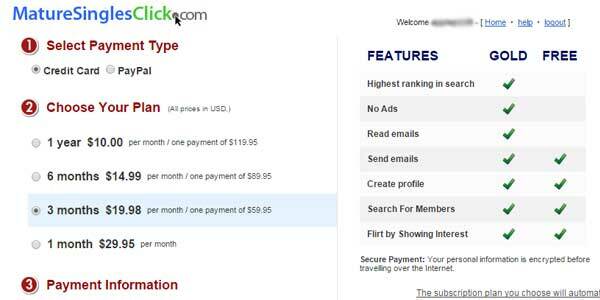 It's definitely worth the upgrades so you can access all the advanced flirting and messaging features, whether you're a new member of the site or have been using it for years. MatureSinglesClick.com shines for its usability. Navigation and features are simple and intuitive. The design is well organized and easy to read, with the exception of the small text. However, all the major browsers make it easy enough to enlarge the screen that this isn't much of a disadvantage for the website. Member profile details aren’t difficult to locate. There are no secondary tabs or pages to filter through, making browsing very simple. You can use the basic search which members can filter for matches based on gender, location, distance and any other specific criteria in form of a “keyword”. For example, if you are an avid gold player, type in “golf” in the keyword field and it will filter your matches accordingly. The advanced search options are much more elaborate. It allows you to find a match based on the same criteria featured in the basic search with a plethora of optional criteria, such as body type, horoscope, faith, income, smoking, drinking, career and more. The one downside to the search on this website is the sheer number of results. You can't adjust the options to show more profiles on a single page. If you get hundreds of results back from your search, you’ll have to slowly pick through multiple pages just to see everyone, which is a little time consuming as well as easy to get lost when you're clicking back and forth from the profiles. However, this minor issue is easily fixed thanks to MatureSinglesClick’s saved search feature so you can return later to keep sifting through the results, but it won't save your progress. You'll need to remember which page of results you were on separately, and if a few days pass between searches the algorithm mixes up the results so you're seeing people you've already checked out before. This website is perfect for anyone who is only interested in dating mature singles. Very few people on the website fall under the age of 40, so you're sure to find someone closer to your age that shares your life experiences and goals for the future. The price options allow you to save a lot of money by getting a package deal, and the advanced features like the Mega Wink take some of the trepidation out of making the first move. Interested in finding singles of all ages instead of just people over 40? Read up on our review of POF.com to find an alternative with a wider range of potential partners.